Your beach wedding cake is a traditional symbol of your love and happiness - and a scrumptious focal point of your big day and of course of the theme you have chosen too! The modern day wedding cake is the perfect opportunity to create a fabulous statement of your personalities and identity as a couple. Whether it has a humorous tone or a spectacular presence, most couples have great fun choosing their wedding cakes for beach weddings. Consider the style of your beach wedding when planning your cake - simple, dramatic, colorful, fun? If you have decided on a simple, intimate and contemporary wedding you may want your cake to be clean with pristine lines to complement this feel while incorporating the beach theme as well. Your Beach Wedding Cake Theme should compliment the theme of your wedding. The size of the reception venue is another consideration in deciding on your beach wedding cake. If you are having a large reception in a hall with vaulted ceilings, then a tall elegant cake will be perfect. The weather will play a very large part in your selection especially if you are having your beach wedding in the middle of summer. Chocolate or spun sugar does not do well in the sweltering heat! Deciding on the style of beach wedding cake is one thing, deciding on the flavour of cake is yet another! Your cake is in fact edible after all! Decide if you want to serve your cake as the dessert or as an additional sweet option for a dessert buffet. 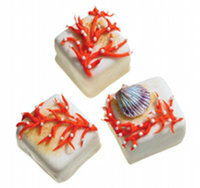 The variety of beach wedding cakes you can choose from these days is virtually without limit. So since you have chosen a contemporary theme, why not opt for an unusual cake flavour. Have a different filling for each layer of cake. If you and your fiance differ on the flavour of cake, this can be remedied by dedicating a different layer to every one of your preferences. If you do decide to go for the traditional fruit cake then why not serve it as part of the dessert menu with a special accompaniment such as a hot brandy sauce, whipped cream or even a soft oozy camenbert cheese! If you are having a spring beach wedding then why not a dense vanilla cake with a fruity (apricot or lemon) filling and a butter cream frosting? A light lemon cake served with a trio of fruit sorbets will be superb on a hot summer day. Or how about an ice cream cake. Just keep in mind that it will obviously have to be frozen for most of the evening and will only be seen right before the cutting. Make sure you assign somebody to take care of setting out the cake and doing the neccessary decoration at the right time. A Crouxembouche is another contemporary option. This is coux pastry eclaires with a sweet or cream filling which is then stacked in a piramid shape and drizzled with chocolate or spun sugar. This will be a delicate cake and will not be suitable for a wedding reception right on the beach. Then there is of course a baked cheese cake, white, milk or dark chocolate cake, poppy seed cake and many more. All of these can of course also be made into smaller cupcakes for a fun element. A fun idea is also to have beach wedding cupcakes! Have a small cake which you can cut as a couple for the formal photos and then have smaller cupcakes arranged in a tier for the rest of the guests. They can be very beautifully individually decorated and is something different and less formal than a 3 tiered wedding cake. Another idea is to box little individual cup cakes and to stack the boxes in a tiered cake format. This is really different and this way your guests can also take their dessert home with them in a cute little themed container. It is also great if you know it will be really really hot and you are worried about your cake melting and looking terrible. Boxes don't melt! Sometimes you just have to see something in order to fall in love with it. It also helps if you shop around and look at many many photos of beach theme wedding cakes to find your perfect wedding cake and then to take the pictures to your cake maker so you are on the same page as to what you expect. Here is our Beach Wedding Cake Gallery. Or perhaps you want to know how to theme your wedding cake to best suit your beach wedding? 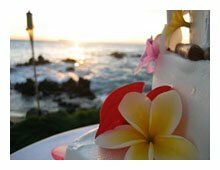 Then have a look at the Beach Theme Wedding Cakes Page. And for another comprehensive gallery of all types of wedding cakes please click here. Your cake topper adds that final beach theme touch to your cake. It finishes off the plainest cake and can add that little bit of humor or class. It also makes a lovely keepsake after the cake has been devoured for you to remember your wedding day by. Looking for that perfect floaty and romantic dress to make you look like a princess? Find out what you need to know before settling on your Beach Wedding Dress. 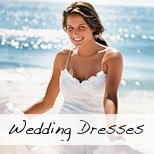 Follow Beach Wedding Guide's board Beach Wedding Hair Ideas on Pinterest.